On Nov 14 the Auditor General released a set of recommendations for the restructure of what has been called a dysfunctional and archaic system of leadership. Other trustees commented that the recommendations will be reviewed and taken under consideration. I find it interesting that you will take the time to review and weigh these recommendations but you did not employ the same thoroughness with the Freeh report. On that topic we have yet to see the release of any information regarding the contract, letter of intent or other materials on the hiring of Freeh Sporkin and Sullivan. In a press conference following the Nov BoT meeting (as reported by the Daily Collegian), Chairman of the Board Karen Peetz said the board would look into the existence of those documents. She said she did not have much information in this area because she “wasn’t directly responsible for hiring him.” “It was not something the board signed on,” you said. You also indicated in an August 2012 memo to PS4RS, that you would “get back to us” on this request. Well, as it was pointed out only 3 parties can authorize an expenditure greater than $25,000. That would be the BoT, the university president or the treasurer of the university. Surely you had enough time to ask David J. Gray, Senior Vice President for Finance and Business/Treasurer for this documentation. If the board can’t explain a 6.5 mil dollar expenditure, that speaks volumes towards the necessity of reforming this board. Implementing the AG recommendations is also important to end the perceived nepotism of the movement of trustees into paid university positions. Schools, such as Mount Holyoke, Bowdoin College, Univ of Montana Western, Ohio University, Colorado Mesa University and the University of NC all require 3-5 years experience in an academic athletic leadership position to be eligible to apply for an athletic director or asst ad position. 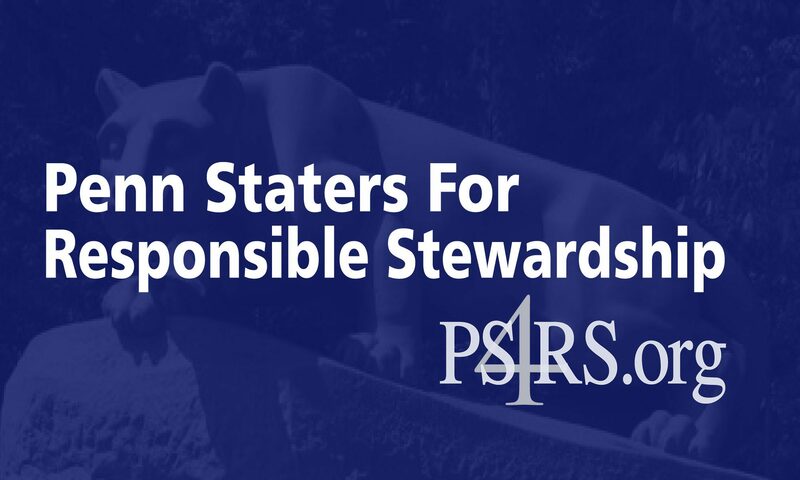 Penn State doesn’t even hold itself to at least these standards in replacing our Athletic Director. Your actions are perceived as nepotism. In fact, that would look just as bad as hiring someone to be a team physician that is woefully under qualified as according to the Team Physician definition, qualifications, and responsibilities consensus statement. This statement is authored by the American Academy of Family Physicians, the American Academy of Orthopaedic Surgeons, the American College of Sports Medicine, the American Medical Society for Sports Medicine, and the American Orthopaedic Society for Sports Medicine. The objective of the Team Physician Consensus Statement is to ultimately, educate decision makers about the need for a qualified team physician and to ensure that athletes and teams are provided the very best medical care. And since we know the board wants the very best for our athletes and our university, the recent rumors surrounding possible changes in university staffing are hopefully unfounded, especially if those changes could be perceived as nepotism in the same way the athletic director appointment has been. Where can we find the BoT’s responses to the public comments made at the January 18 meeting? Are the board members ignorant, arrogant, stupid, self-serving, hypocritical, cowards, or all of the above? I’ve yet to see any changes from the board members.